Greece, Spain, Italy. Eurozone. Austerity. For stock investors, it’s just more of the same—the same rollercoaster of hope and despair about any of a number of potential outcomes…without resolution. On Wednesday, stocks had their strongest one-day rally since December. Ostensibly, it was due to word on the street that central banks and the Fed will coordinate a global money-printing operation to deliver us all from the threat of global recession. Whatever the cause of Wednesday’s rebound, whenever the charts are buried in the depths of oversold territory, anticipation of a sudden reversal is high, and nobody wants to be the last one on the bandwagon if and when the tide turns. A hopeful story like we heard on Wednesday will often lead to a powerful relief rally. But will there be follow-through? Well, the fact that traders didn’t take profits before the close of trading is a promising sign. Fed Chairman Ben Bernanke is scheduled to testify before a congressional committee on Thursday. And the new Greek elections are set for June 17, which may determine the future of Greece as a member of the monetary union. With their 10-year bond yielding over 30%, something is going have to change. But if they want to print their own money, it will have to be a return to the Drachma. SPY closed Wednesday at 131.97 to get back to where it was last Wednesday and recapture the 200-day simple moving average that it had briefly lost. The bear flag pattern from last week was indeed confirmed on Friday, but the chart suddenly looks much better after Wednesday’s strength. 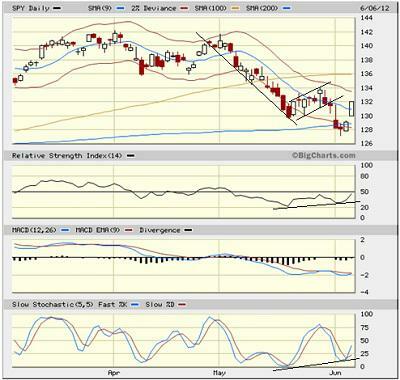 RSI and Slow Stochastic diverged from price by forming higher lows. MACD looks less impressive, but might be ready to turn up, as well. The TED spread (indicator of credit risk in the general economy, measuring the difference between the 3-month T-bill and 3-month LIBOR interest rates) closed Wednesday at 39 bps, holding the same level that appears to be its new comfort zone. The VIX (CBOE Market Volatility Index—a.k.a. “fear gauge”) closed Wednesday at 22.16, down 10% on the day. Given the persistent worries about global recession, both VIX and TED remain low. As a reminder, The MacroReport provides an in-depth analysis of the macroeconomic trends in around the world and their impact on the U.S., along with actionable ideas (U.S. stocks and ETFs). Complimentary access is still available on Sabrient’s web site through MacroReport InterActive. The current issue focuses on global oil. The March and April issues talked about scenarios that might play out in Greece and in China. 1. The rankings are holding steady with only minor shuffling. 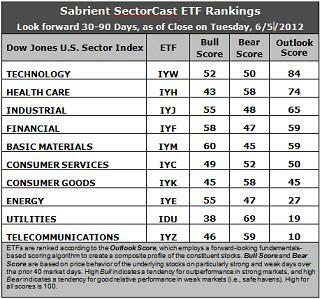 Technology (IYW) remains in the top spot with a 84 this week, followed by Healthcare (IYH) at 74. Industrial (IYJ) remains in third, followed by Financial (IYF), Basic Materials (IYM), and then Consumer Services (IYC). This is a bullish top six, and all of them have an Outlook score of 50 or higher. 2. Utilities (IDU) and Telecom (IYZ) remain in the bottom two. IDU is saddled with the lowest long-term growth rate, and IYZ has the highest (worst) forward P/E. With Consumer Goods (IYK) in the bottom four, we see that defensive sectors bunched at the bottom. Also, stocks within Energy (IYE) continue to be downgraded by the analysts. 3. Looking at the Bull scores, Basic Materials (IYM) has been quite strong on strong market days, scoring 58, followed by Financial (IYF), Industrial (IYJ), and Energy (IYE). Utilities (IDU) is by far the weakest on strong days, scoring 38. 4. Looking at the Bear scores, Utilities (IDU) remains the investor favorite “safe haven” on weak market days, scoring a strong 69, followed by Telecom (IYZ), Consumer Goods (IYK), and Healthcare (IYH). Materials (IYM) has the lowest Bear score of 45. Stocks within IYM have tended to sell off the most when the market is pulling back. 5. Overall, IYW now shows the best all-weather combination of Outlook/Bull/Bear scores. Adding up the three scores gives a total of 186. IYZ is the worst at 115. IDU reflects the best combination of Bull/Bear at 107, mainly due to its huge Bear score. Healthcare (IYH) displays the worst combination with a 101. These scores represent the view that the Technology and Healthcare sectors may be relatively undervalued overall, while Telecom and Utilities sectors may be relatively overvalued based on our 1-3 month forward look. Top-ranked stocks within Technology and Healthcare sectors include NetEase (NTES), Red Hat (RHT), Questcor Pharmaceuticals (QCOR), and POZEN Inc. (POZN).